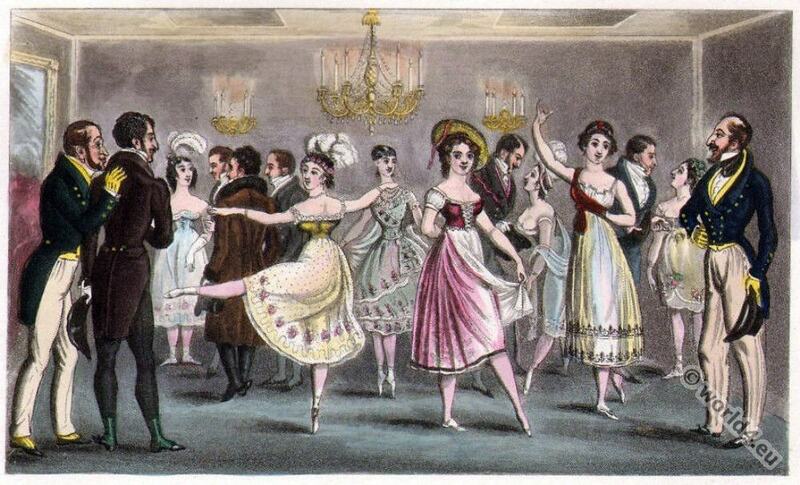 Premières danseuses and their admirers – the Green Room of the Opera House (King’s Theatre) 1822. From left: Earl of Fife. Ball Hughes. Mdlle. Mercandotti. Prince Esterhazy (in the back with Mdll. Noblet). Mdlle. Hullin. Lord Petersham. Tags: France Empire, Romantic era. Biedermeier era. Early Victorian. Dandy Clubs – Dandysme, Satirical 19th century. This entry was posted in 1822, 19th Century, England, Georgian period, Regency period, Romantic Era and tagged Dandy, Romanticism fashion, The Reminiscences and Recollections of Captain Gronow on 2/27/15 by world4.